“I want to pick strawberries”, I told the lady in one of the farms in Bishan Road. “You can go upstairs. We have a strawberry farm there”, she replied. I became very happy when I heard those words. Last week, I went here in the mountains of Neihu to bring home the red “botanical” berries that we crave to eat. It was a Sunday and I was told that I cannot do what I want since there were no more fruits to pick on. But like a sweet revenge, I went back and was given a basket and a pair of scissors in today's episode of Travel in Taiwan. I still remember my strawberry picking adventure in Miaoli province. Travel Buddy Mavis and I boarded a local train from Taipei to Miaoli Station and then we transferred to a bus going to Dahu. The trip was of one of most difficult travel itineraries that I have ever made considering the lack of English information on how to reach a strawberry farm in Miaoli in a step-by-step procedure. To reach the strawberry farms, I boarded the Taipei MRT and alighted at Neihu Station. From Exit 1 of the MRT Neihu Station, I walked for a few meters until I found the Bus S2 stop (Bi Hu Elementary School stop) along Neihu Road Section 2. Thanks to the mountains of Neihu, Taipei has been blessed with a place to grow our favorite “fruit” and there is no need to go to Dahu Township. How to get here? Board the MRT to Neihu Station and then go to Exit 1. 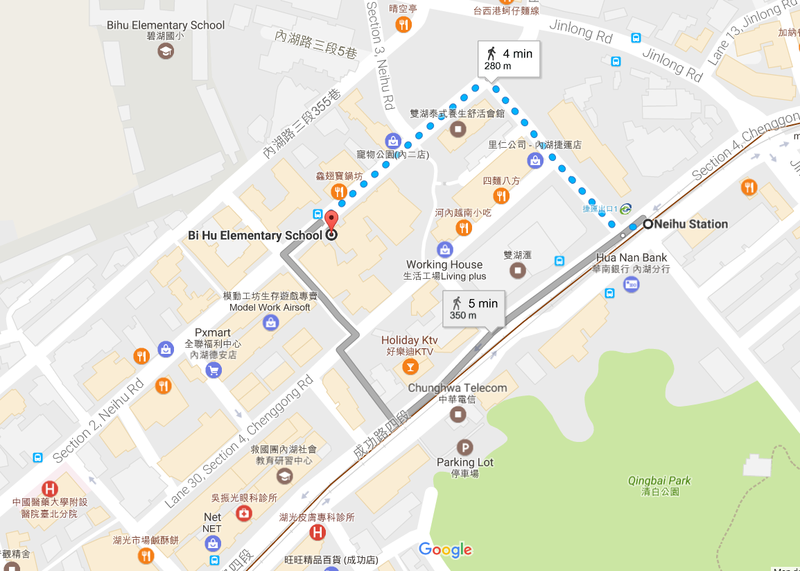 Look for Section 2 Neihu Road by walking along Jinlong Road. You can also reach the bus stop by going to Alley 6, Lane 182, Section 4, Chenggong Road. Both streets would lead you to Section 2 Neihu Road where you can find the marker for Bus S2. Alight at the Sightseeing Strawberry Orchard stop (觀光草莓園) and your strawberry adventure will eventually begin. But there is a catch here on this place in Neihu! Picking strawberries in Taipei is not like going to a shopping mall anytime you want. There are some things that you need to know like the strawberry season in Taipei. It starts in December and ends in May. You also have to set your strawberry picking on a Saturday morning at 9:00 am because most farms are not open to visitors on weekdays. If they do allow, then there won't be enough big strawberries every week. Going on a Sunday morning will also be useless so you really need to come here on a Saturday before the farms have opened their gates. The staircase leading to the 內湖草莓園 strawberry farm. It is located at No. 49, Bishan Road. The view once you get to the top of the staircase. I was given a pair of scissors and a basket by the caretaker. There were already visitors picking strawberries but they were only a few since the farm had just opened. I was surprised after climbing the staircase that the lady told me. There was a white tent at the top of the hill and it functions like some sort of a greenhouse. Inside were rows of strawberry plants and I got really excited upon seeing it. The air here smells like a strawberry jam that has just been opened. “I want to pick strawberries”, I told the guy who is in his 40s or 50s. He doesn't speak English but he knew what I was about talking about so he gave me a basket with a pair of scissors. There were already two or three families inside when I started picking the fruits. At 9:30 am, the place was not yet crowded but after 30 minutes more visitors have entered the tent. Before I forgot, the farm’s name is 內湖草莓園 and its address is at No. 49, Bishan Road. When picking strawberries, inspect if there are any holes made by insects or worms. How to pick strawberries? Cut the stem of the fruit using a pair of scissors. How to pick strawberries? It's as simple as saying “A, B, C”. Just look for that luscious-looking red fruit hanging on the plastic-covered soil. Check its underside if it’s red in color. Don't also forget to check for any holes. You don't want to bring home a strawberry with a friend inside. Haha! Once you have chosen your strawberry, use the pair of scissors to cut the stem. Be careful when you cut it because you don't also want to cut the flowers and the white strawberries that were just starting to grow. A strawberry hiding under the leaves. Oh! The one in the middle is cute and has a perfect shape. My basket as I get more strawberries in the farm. There were a lot of big strawberries that were not yet picked so I checked them out. Their surface was a bit wet and probably due to the moist in the air and the cold temperature during winter. I felt that they were already ripe so I cut their stems and put them in my basket. At first, these big fruits might taste sour but give it a few days in the fridge and it will taste like sugar. At around 11:00 am, I was the only one left on the farm. My basket already felt heavy and I went near the entrance to have it weighed by the caretaker. After picking, I gave my basket to the caretaker to have my harvest weighed. I put the basket on the table and my attention got focused on the weighing scale. It was interesting to see metric units in kilo as well as numbers with the Chinese character for jin (斤) which means to 600 grams. My harvest was then weighed and the pointer stopped at the 1-kilo mark. If I remember correctly the price of the strawberries on this farm was NTD 315 per 600 grams. I paid NTD 530 which is just right when I computed the equivalent amount for my 1 kilo of strawberries. I paid NTD 530 for these strawberries. "Pick me", said by the strawberry. My fruits were put in a pink carton box. Before I left the place, I looked again at the rows of strawberries as I held my harvest. There were only a few left untouched but give one or two weeks and the place will smell again like a strawberry jam. Soon, visitors will flock again here. They would listen to the sound in the air as tiny voices coming from the cute little red things on the farm say “Pick me”. Good blog, well explained, full of details unavailable anywhere else. Question: I plan to go Saturday December 02 2017 Is this too early ?? It depends. If the weather in Taipei becomes cold in early December, it would be the start of the strawberry season in Neihu.